Creep into the Deep Missions | WhaleTimes, Inc. Creep into the Deep™, takes your STEM curriculum to new depths! Created in 2009, WhaleTimes’ Creep into the Deep creates a connection between scientists and students. It also lets you bring deep-sea animals, exploration, and science into your classrooms in a unique and inviting way. What’s in the deep that a kid would like? Animals dressed in red velvet, some as transparent as glass, and others that flash and ripple with light so bright they could light a room. Every animal and discovery in the deep is weirder and more wonderful than the next. Only 5% of the ocean has been explored. In order to protect the ocean, there is so much more we must learn. 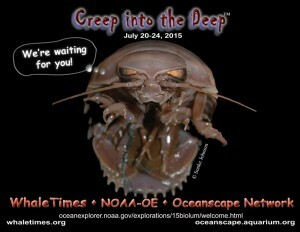 Join us on a mission to investigate how the cool creatures that creep in the deep survive! Designed for 3-6th grade classrooms. By participating in the program, students become Virtual Members of a deep sea mission, receive daily emails from scientists, photos, and answers to their questions. Students even send their autographs into the abyss! Creep into the DEEPEND™ 2017 news! Parents, once again you can enroll your child in a Creep into the DEEPEND Summer Camp at a museum or science center near you.